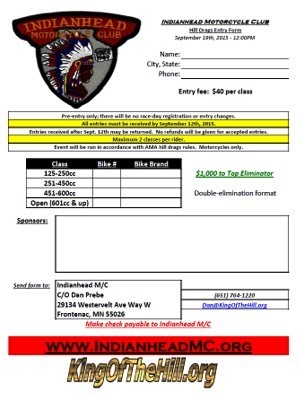 …to get your entries in for the 2015 Hill Drags event at Indianhead M/C in Red Wing, MN! In conjunction with the Flood Run weekend, on Sept. 19th IMC is hosting a hill drags with cash payback for all classes, and a guaranteed $1,000 prize for Top Eliminator! Click the giant image of the registration form to open it – print it out, fill it out, and send it in! Sept. 12th is the deadline for rider signup, and you sure as heck don’t want to miss the funnest hillclimb event of the year! And don’t forget that IMC is also hosting a Semi-Pro climb on the 20th following the drags – cash payback to all classes, and you get to run paddle tires and alcohol if you want! Both the hill drags and semi-pro event are being run in accordance with AMA rules, and that allows for paddle tires and alcohol (in your bike, not in you) on Sunday. Registration for the semi-pro climb is on race day like usual.